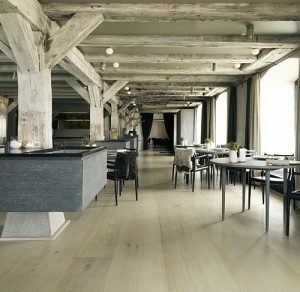 Timber flooring is often recognised for its sustainability and beauty. It provides you with the ability to express your personality and style, regardless of the room size. 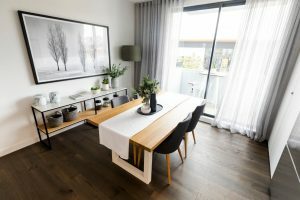 With a few clever design tricks, timber flooring can also help create the idea of more space, allowing you to make your small living spaces appear bigger. Read on to find out a few tricks to give your room a more spacious feel. Using a wider plank means fewer seams, which will make the floor appear less busy and as a result will create the idea of more space. Check out our Super Planks collection made out of extra wide oak planks, epitomising grandeur and elegance. To produce these extra wide planks, we source the largest and finest trunks from sustainable forests. Every piece is unique with each plank having its own unique grain and knots. Another clever trick to create the illusion of more space is to have your wide boards run parallel to the longest wall in your room. By doing this, space will instantly appear bigger, making it look like your room runs forever. For a smaller room, people often think that a lighter colour is the way to go, however dark floors can work just as well for small spaces! Besides giving your room a luxurious appearance, dark timber will help any small room feel bigger when balanced against light coloured walls. In fact, opting for dark colored flooring will allow the cool tones to recede and the warm colours to stand out. Our Milano collection has a great range of colours, from light to dark, from warm to cool tones. Additionally, the Milano timber collection 15mm thick floor is a great alternative to the 20mm thick range, where there are finished floor height restrictions. Coated with WOCA hard wax oil, the collection also combines durability and low maintenance, making it the perfect option for any type of space. Why not think outside the box? Using timber as another textural element can build character to a room whilst creating the effect of room expansion. 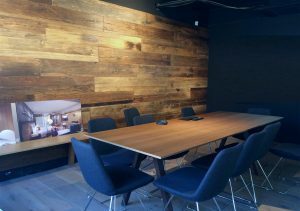 Not only does this create the perfect way to make a statement for a feature wall, but having timber laid across could rapidly make your room look longer. At Style Timber, we dispose of a large range of timber species, grades and textures to suit your requirements. Take a look at our Reclaimed collection. This collection includes genuine recycled timber and reclaimed reproduction wood of mixed species such as European Oak, American Red Oak and Elm. To talk about your next project, or to request samples of our timber, get in touch. PreviousPrevious post:Creating distinct spaces in open plan livingNextNext post:Dark or light timber flooring: what’s the best option for your space?